Managing input is usually complex, no matter the OS or platform. To ease this a little, a special built-in type is provided, InputEvent. This datatype can be configured to contain several types of input events. Input events travel through the engine and can be received in multiple locations, depending on the purpose. However, it is cleaner and more flexible to use the provided InputMap feature, which allows you to define input actions and assign them different keys. This way, you can define multiple keys for the same action (e.g. they keyboard escape key and the start button on a gamepad). You can then more easily change this mapping in the project settings without updating your code, and even build a key mapping feature on top of it to allow your game to change the key mapping at runtime! Every input event is originated from the user/player (though it’s possible to generate an InputEvent and feed them back to the engine, which is useful for gestures). The OS object for each platform will read events from the device, then feed them to MainLoop. 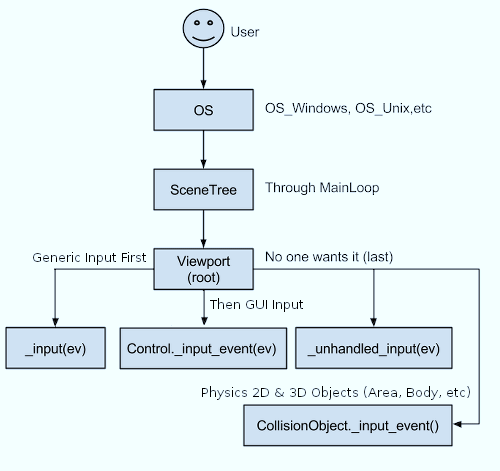 As SceneTree is the default MainLoop implementation, events are fed to it. Godot provides a function to get the current SceneTree object : get_tree(). First of all, the standard Node._input() function will be called in any node that overrides it (and hasn’t disabled input processing with Node.set_process_input()). If any function consumes the event, it can call SceneTree.set_input_as_handled(), and the event will not spread any more. This ensures that you can filter all events of interest, even before the GUI. For gameplay input, Node._unhandled_input() is generally a better fit, because it allows the GUI to intercept the events. Second, it will try to feed the input to the GUI, and see if any control can receive it. If so, the Control will be called via the virtual function Control._gui_input() and the signal “input_event” will be emitted (this function is re-implementable by script by inheriting from it). If the control wants to “consume” the event, it will call Control.accept_event() and the event will not spread any more. Use the Control.mouse_filter property to control whether a Control is notified of mouse events via Control._gui_input() callback, and whether these events are propagated further. If so far no one consumed the event, the unhandled input callback will be called if overridden (and not disabled with Node.set_process_unhandled_input()). If any function consumes the event, it can call SceneTree.set_input_as_handled(), and the event will not spread any more. The unhandled input callback is ideal for full-screen gameplay events, so they are not received when a GUI is active. If no one wanted the event so far, and a Camera is assigned to the Viewport, a ray to the physics world (in the ray direction from the click) will be cast. If this ray hits an object, it will call the CollisionObject._input_event() function in the relevant physics object (bodies receive this callback by default, but areas do not. This can be configured through Area properties). Finally, if the event was unhandled, it will be passed to the next Viewport in the tree, otherwise it will be ignored. 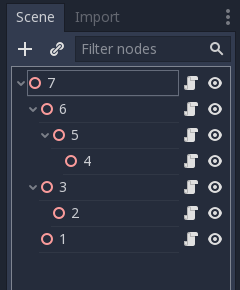 GUI events also travel up the scene tree but, since these events target specific Controls, only direct ancestors of the targeted Control node receive the event. In accordance with Godot’s node-based design, this enables specialized child nodes to handle and consume particular events, while their ancestors, and ultimately the scene root, can provide more generalized behaviour if needed. InputEvent is just a base built-in type, it does not represent anything and only contains some basic information, such as event ID (which is increased for each event), device index, etc. InputEvent NONE Empty Input Event. InputEventKey KEY Contains a scancode and unicode value, as well as modifiers. InputEventMouseButton MOUSE_BUTTON Contains click information, such as button, modifiers, etc. InputEventMouseMotion MOUSE_MOTION Contains motion information, such as relative, absolute positions and speed. InputEventJoypadMotion JOYSTICK_MOTION Contains Joystick/Joypad analog axis information. InputEventJoypadButton JOYSTICK_BUTTON Contains Joystick/Joypad button information. The same code to work on different devices with different inputs (e.g., keyboard on PC, Joypad on console). Input to be reconfigured at run-time. Actions can be created from the Project Settings menu in the Actions tab. Any event has the methods InputEvent.is_action(), InputEvent.is_pressed() and InputEvent. Customizing and re-mapping input from code is often desired. If your whole workflow depends on actions, the InputMap singleton is ideal for reassigning or creating different actions at run-time. This singleton is not saved (must be modified manually) and its state is run from the project settings (project.godot). So any dynamic system of this type needs to store settings in the way the programmer best sees fit.